So, there I was again, looking for a kayak. This was not my intention. I would have been more than satisfied with the Zegul Arrow Play HV, had it been of a good enough construction. Now I returned it to the shop and will get a replacement kayak of another brand sometime next year. 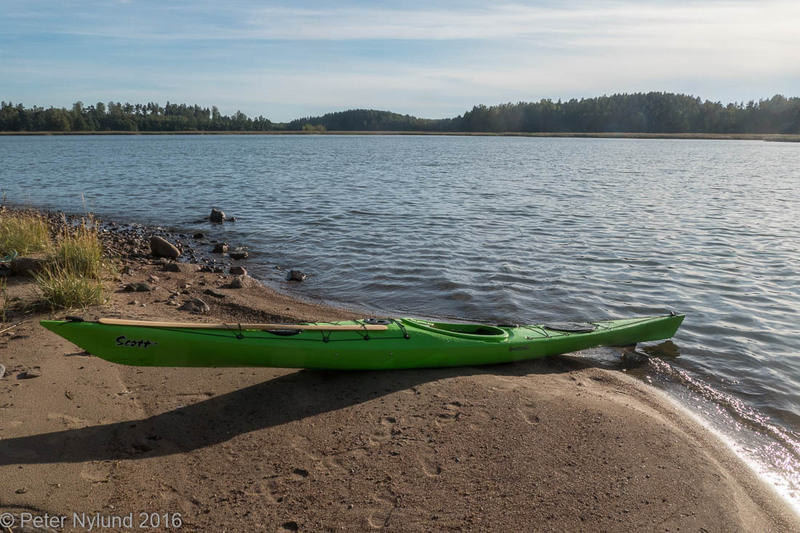 I started to think about options, since I wanted a kayak for guiding and exams later this fall, and suddenly remembered the plastic Scott I tried in April in the pool of the Maritime Safety Center of Mariehamn, Åland. I recalled liking it, but wasn't sure how well I fit. 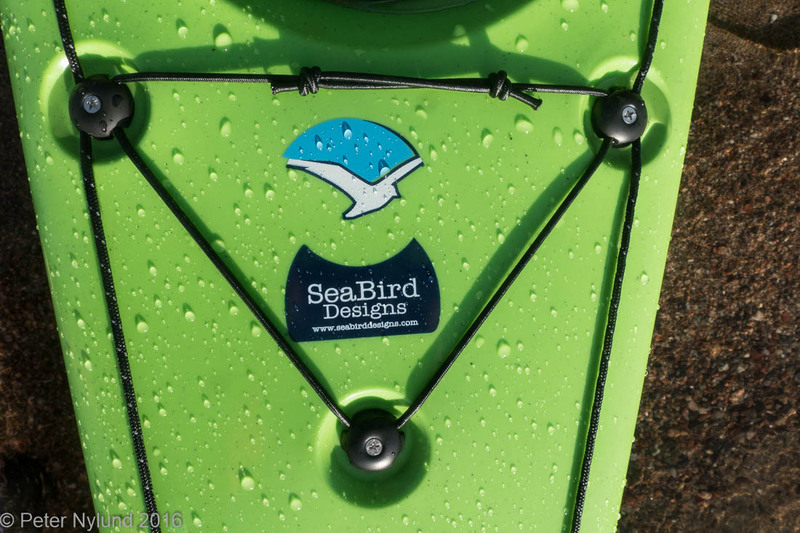 A quick message to Benjamin Donner of Aavameri revealed that he had just gotten a shipment of kayaks from Seabird, including a Scott MV HDPE. I went to see how it fit me and ended up buying it. 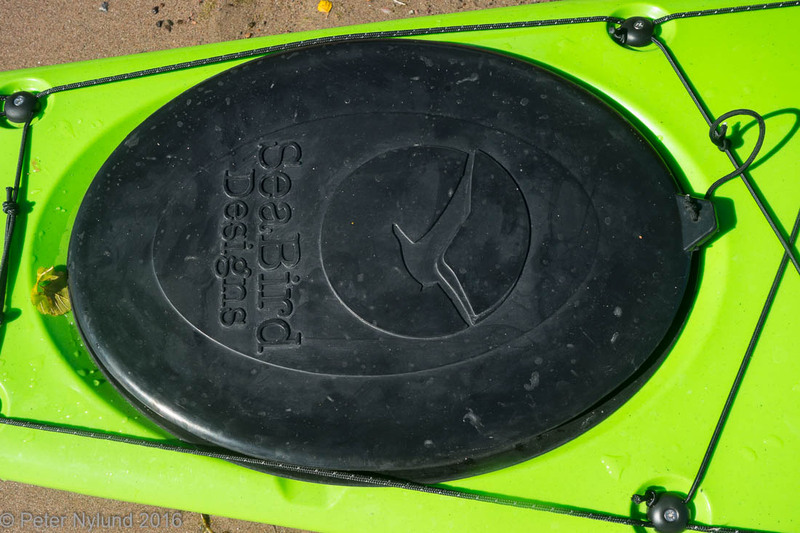 The Seabird Scott MV HDPE is a sandwich polyethylene (PE) version of the composite Scott series, which is a nice line of playful British style sea kayaks for a good price. I had previously tested the Scott HV, in which I fit fine, though the kayak otherwise felt a bit big. Despite my size, 192 cm and almost 100 kg, I like smaller kayaks, which in practice means mid size, since I can't get into anything smaller. It's not a lack of flexibility, but rather too long legs. The composite Scott MV, on the other hand, was a tad too small for me. The PE version is only available in size MV, but it is not a straight copy of the composite version. It slightly longer, but also lower. The shallow V midsection also seems to be a bit flatter in the PE version. The cockpit is 2 cm longer, which is enough for me to fit adequately, even though it is lower. Lengthwise there is more room inside in the PE version and the seat also is more comfortable. 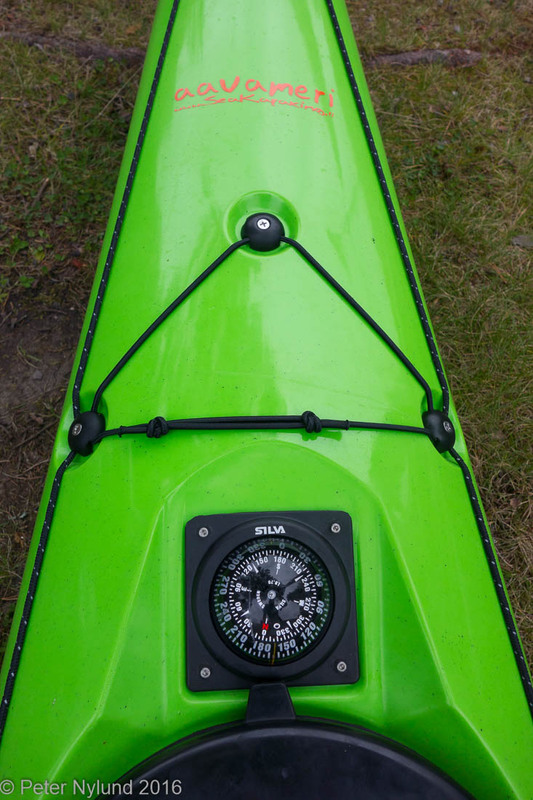 The entire kayak is lower, also in the cockpit, but I don't like a high "knees up" position anyway, instead preferring to paddle with me legs only slightly bent over a paddle float. The knee braces are a tad aggressive and big for me, though, and I might very well do some modifications here. 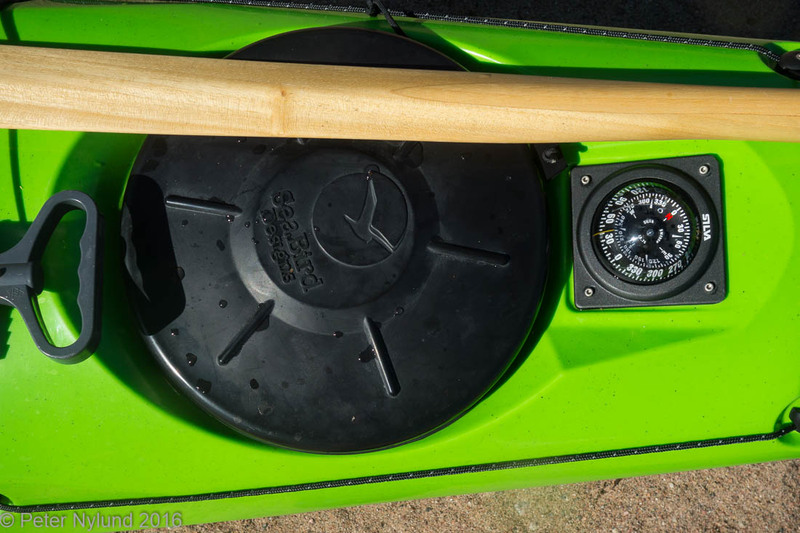 There is the usual place for a Silva (nowadays Garmin) 70P compass, which is one of the first things to mount on a new kayak. 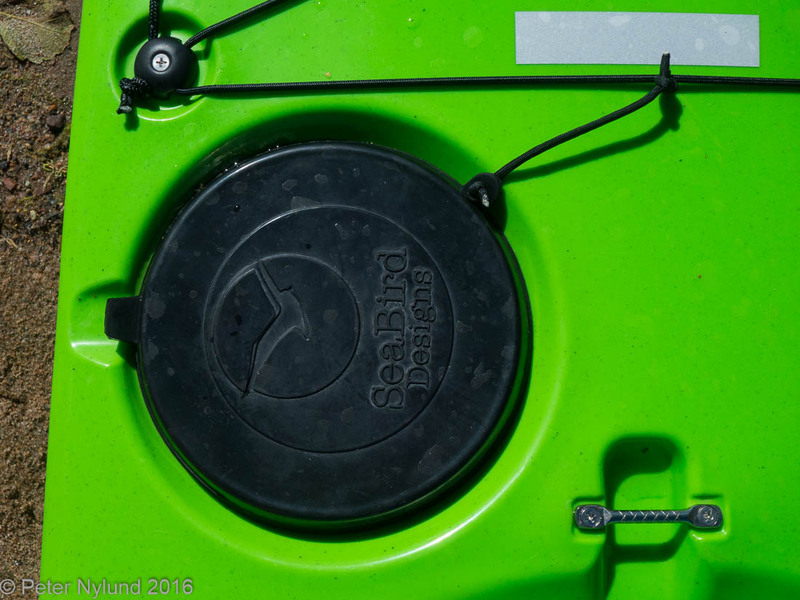 The hatches are Seabird's own production and seem good enough. 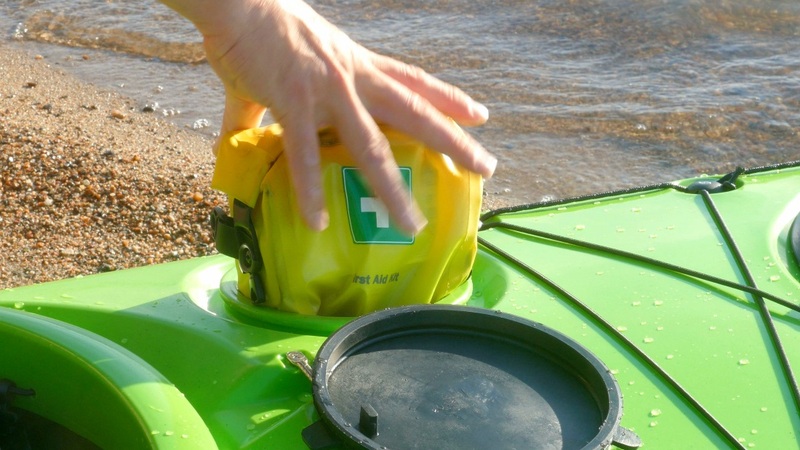 With the exception of the front day hatch, the hatches have been perfectly tight during rolls, waves and rescues. There's a large oval hatch in the back (without it I couldn't bring my pizza oven) and a smaller round hatch in the front. 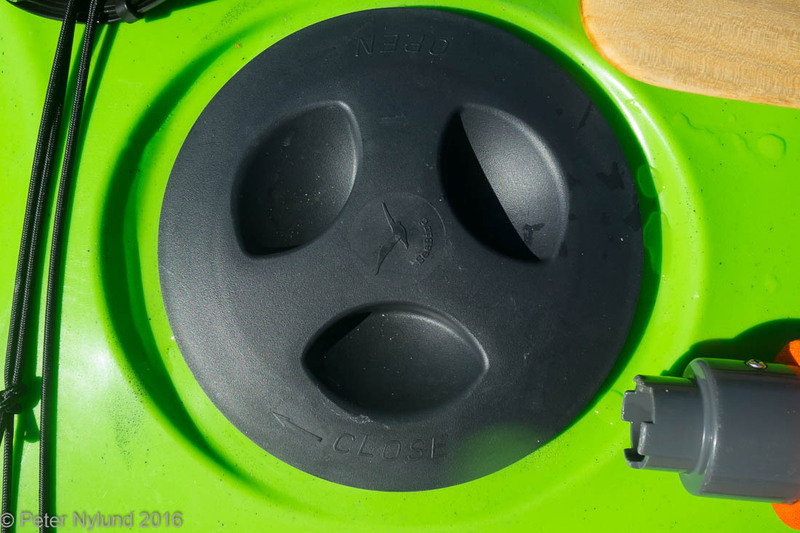 The front day hatch is probably not even designed to be totally waterproof, though. A few drops of water entered. The rear day hatch is unnecessarily small. There is plenty of space inside, but it all has to fit through a 15 cm opening. No deal breaker, but poor design in my opinion. The hatches were not tethered from the start, but that doesn't take many minutes to fix. The seat was mounted in the same way as on the Arrow Play, i.e in practice hanging from the extended cockpit coaming, a construction that definitely does not work for someone my weight. The seat moves too much. I solved it the same way as in the Arrow Play, by putting a rubber mat under the seat. 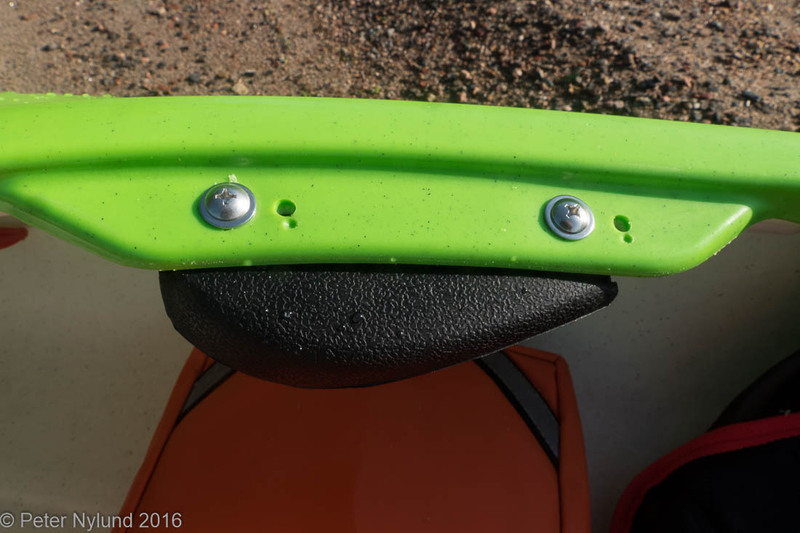 The seat rests mostly on the rubber mat, the friction of which should keep if from moving sideways. The rigging is good, better than on the composite Scott versions. With deck balls on a few places the deck lines will be further improved. I immediately took the kayak out for some further testing after having fetched it. The video below sums my first impressions of it. 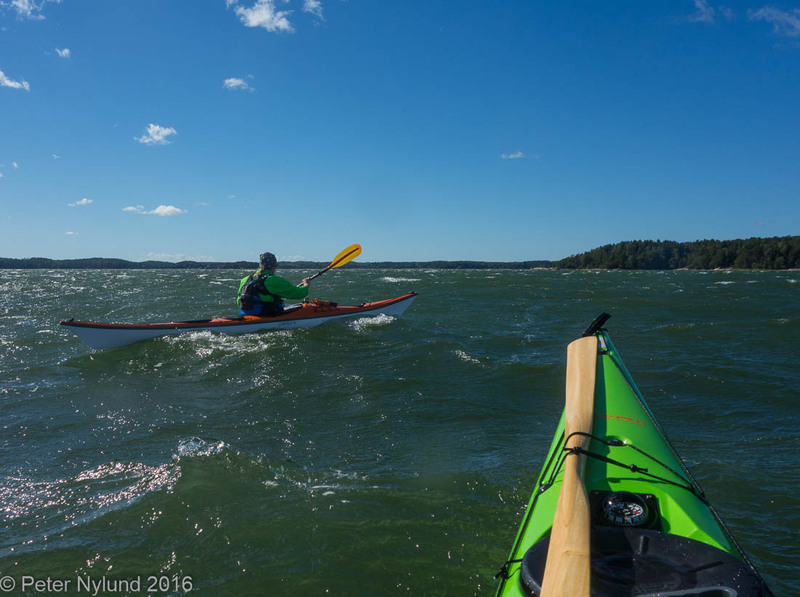 A few day's later I tried it in a little harder wind when I paddled with Jarkko. Not any real pictures, though, but the wind was at most around 12 m/s and up to 18 m/s in the gusts according to the log nearby. No big waves, though, but the kayak worked well in the wind. All in all, the kayak is pretty much what I assumed and hoped it to be. It a fun and agile British style kayak for a very good price. It is stable enough for guiding and the material should be almost bomb proof. The HDPE material seems stiff enough, certainly much stiffer than the PE Nordkaps I've seen. The speed is enough for touring and the kayak seems to surf well, though I haven't really tested this thoroughly. The night was humid and warm, but the sun soon dispersed the fog. We didn't have any real waves anymore, but there are always exercises to be made. Today would take us to Måseskär. We started in low tide. The water was nice and clear. We started with some playing around the rocks we had steered clear off the days before. Benjamin did a nice sidesurf, but I didn't manage the same. The wave caught me at its strongest, just breaking over me. The sidesurf was too long for me and I lost support and couldn't get up immediately. When I got up I was just in position to be washed over the reef. Done the wrong way this could have been dangerous: The right way is to show the kayak bottom towards the danger, to avoid getting between the danger and a kayak being thrown right on you. The wave was strong enough to lift me over the rocks and the kayak might have gotten some small scratches, but nothing more. The others were however not keen on trying it. We continued paddling and playing close to the shore, though. Benjamin had trouble staying in the kayak and needed to be rescued again, as did someone in the background. Another excellent place to capsize. The cockpit coaming of my kayak cracked during a rescue, but didn't let in much water. A small lion's mane jellyfish. We had dinner around one of Sweden's most important artillery outposts. A swallowtail liked my Ikea bag. This is a really beautiful butterfly. A group of seals swam by. A few more views from the island. ... and then continued to the back of the island, which offered a nice place for exercises. Yours truly. Photo by Benjamin. After these fun and refreshening exercises we went to Käringön, for a sauna and an excellent fish dinner. We stayed at the restaurant until it got dark and then paddled back to the camp in darkness in small groups. No pictures, though, since I didn't have a good enough camera for it. The night paddling went without problems, though I would like a better light for the compass (we planned the route with compass directions, time/distances and beacon signatures). A red chemical lightstick didn't illuminate the compass enough. The next morning we did some games, exercises and teaching practice. A special case of a problem we tried in the pool sessions in the spring. I think we handled this one quite efficiently. After lunch we went out for some for play and exercises, this time to Härmanö to the north. Johan is becoming one with the sea. Getting some trash out of the sea. I probably have something really important to say. Picture by Benjamin. Yet another rescuing method. The rescuee stays low on the back deck of the rescuer, who tries to paddle to safety. With me on the back deck the Seabird Qanik floated a bit low, but we made it to safety. A short break. Everyone had the possibility to land on a different island. Going back in small groups. I took us through some nice spots. Back at camp Benjamin showed us how to adjust and fix a problematic skeg wire before dinner. Silene vulgaris? Or is it just an extra fat silene uniflora? And yet another beautiful evening, with the moon being almost full. The final morning had us wake up early. We had a boat to catch in Stockholm. We had everything packed and started paddling at eight in the morning. The ferry going to and from Käringön every few hours. We packed our stuff and drove to Stockholm, where we managed to catch the boat to Finland with a rather narrow margin. This was yet another excellent course module. We practiced lots of rescuing and other techniques, in different conditions, and I definitely learned a lot. On a personal level, I had no problems in the waves and could relax and enjoy the ride. I gained some more skills and a more confidence in myself. My roll also turned out to be reliable. This was also the final trip for my Zegul Arrow Play HV. I returned it to Melontapiste as not worth fixing, at least not for me. For easy use it could still be fixed to be usable, but it is not a play boat constructionwise, even if it worked really well in theses conditions. Thanks to everyone for a great time and to Benjamin arranging it all.